Celebrities hunt for antiques across the UK. Nicholas Parsons and Gyles Brandreth scour Surrey for collectibles, aided by experts Paul Laidlaw and David Harper. Browse content similar to Nicholas Parsons and Gyles Brandreth. Check below for episodes and series from the same categories and more! To make the biggest profit at auction. But it is no easy ride. I've got my antiques head on. Just a minute - ha! It's only Nicholas Parsons and Gyles Brandreth! we are not the antiques. Er, well, Gyles, you're very modest. You're much younger than I am. They are masters of the articulate argument...and indicating left, by the look of things. I am reaching the antique age, I think. I mean, like good antiques, you keep them polished and they look great. At 92 years of age, Nicholas is a national treasure. radio and occasional TV panel show, Just A Minute. has been his old friend, Gyles Brandreth. -Page by page... Oh, no! Gyles is a polymath, a Renaissance Man. And who can forget his taste for natty jumpers? ..wanting one of my jumpers for their costume collection. I love that sort of story. Representing the height of 1980s fashion. A Gyles Brandreth jumper. and driving a 1965 MK2 Jag are our experts. This car is low-key for us. -I noticed your trousers. Red leather is a good look! I see you've got the khaki circa 1944 World War II pants on. Let's focus on the trip, shall we? -Nicholas Parsons and Gyles Brandreth. Who're we going to go with though? How're we going to pair off? -If you don't mind, I'm a bit of fan boy for Just A Minute. I love it. But could you imagine doing it? Could you do that? -I've hesitated already. I'm out! I think Gyles is brilliant. I love him on The One Show. He's fantastic. ..so I think he'd be a laugh a minute, so that'll be good. OK, good deal. And hopefully, the first of many to come. Both our teams start this trip with £400 to spend. and then back out to Hertfordshire for our auction in Bushey. But first, time to pick up our celebrities. Oh, here they are. Ooh! Nice car. 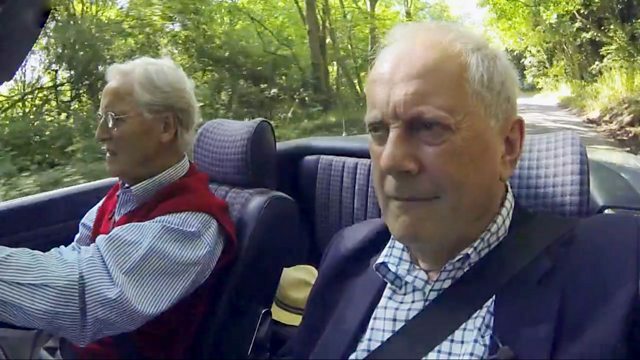 Nicholas Parsons driving a Mercedes SL! Coming to see us with Gyles Brandreth! Unbelievable! -I'm wanting the one in the red trousers. -I can't believe Gyles Brandreth has said that to ME! -It's exciting. I'm a big, big fan of yours. -Somewhere nearby. Shall we take the German vehicle? -Just to mix it up a little. -This is the Mercedes, you mean? -So what do we get? -A Jaguar! Look at that! -I'm happy to... Do you want to toss for it? You drive. With teams decided, it's time to get acquainted. So, have you been with Just A Minute from the first episode? I did the original pilot and I'm still doing it after over 900 performances. It's one of those romantic stories of show business. -But the pilot was a disaster. -Oh, they didn't want it. They had a very clever young producer then, called David Hatch. "liked about the pilot was your chairmanship." And I said, "But, David, I was awful!" He said, "I know, but so was everybody else." and complete with its own medieval high street. John Cleese called it home, for a while. And today, we're visiting Heritage Antiques. Lovely. -or are you a regular frequenter? -Oh, no, I'm not a regular frequenter. ..and I have one or two at home, but I don't get the time to browse. Here to help them out is the very affable John. -John. John, good to see you. -This of course is Nicholas. -Are you the owner, John? -Right. Gosh, what a collection. Are you in this to win it? Or are you in it to spend money? -I'm in it to have fun. What about the serious stuff? You've got to do it with charm. You can be ruthlessly charming. "Ruthlessly charming", eh? He sounds like one to watch. I've got one like that. Do you have a reproduction or a real one, from the 1920s? I've got a real one, I've got a real one, 1920s, and it actually works. and can often be adapted to work on a modern phone line. For me, that's the dream. -Well, how much do they want for this? 60... Oh, no, no, no. I like the way you think! Which is, "That price is rubbish!" I know how much I paid for mine. I was only going to offer them not a penny more than 40. You're more generous than me, Nicholas. -What are you going to offer them, 30? -£25? Let's try and get it for £25. Let's see what we can do, shall we? Let's see this ruthless Parsons' charm in action! -I can't go down that much. 30 and we will take it. Oh, that's a good excuse, isn't it? 30, all done. -You don't beat about the bush, Nicholas, do you? May I say, I love your work, Sir! Nicholas and Paul are not done in here yet. But let's see how the opposition are getting on. This is very exciting, isn't it? And this...is a perfect English day. -Don't be putting the pressure on me. -I've got the world authority on everything. We are going to turn our £400 into something that is record-breaking. Nothing like aiming high, eh? Their first shop is Berkhamsted's Home & Colonial. We are going to be charmingly ruthless. Hey, that phrase sounds very familiar. And here to help them are Louise and Ali. Don't look quite so scared, girls. to find an item or two here that we want to buy. -I have a target in mind and I have a rule. -Yeah, you do, you do. Because with my wife we go and what we normally do, is start at the top and work down. And my wife says to me, "This has been the story of your life, hasn't it, Gyles? "Starting at the top and working your way down." -So we can do that here as well. -Welcome to the Antiques Road Trip. You'd better get up those stairs then, hadn't you? -I'm after big and colourful. Because I am with you and you epitomise big and colourful. I'd take that as a compliment, if I were you, David. Here's one celeb who came to shop. It's the story of my life, you know. Remember, I used to be a Member of Parliament. -I was actually in the government. And now I'm trawling about second-hand shops with you. -In a pair of red trousers. -Yeah. It's come to this. -What has life come to? -It's not that bad, they could be those green ones. I think this is quite charming. with boats in the foreground. -It's clearly late 19th century. -They're trying to sell it here for £25. -We're going to get it for 15. Nothing like setting yourself a challenge, Gyles. We like the look of this. And we'd love to buy something from you. It is, it's charming, isn't it? And we see that it is £25. -be able to give us? -That's a bargain for that, it's beautiful. -20... 18, did you say? -Oh, I like a strong woman. Why don't we blow 20 quid? -You know, Gyles, I think we should. -Why don't we blow 20 quid on this? But they're not exactly splashing the cash, are they? How are Paul and Nicholas getting on? Now, see, that looks, at first glance, like a half-decent specimen. It is a very decent specimen. He's spied a Victorian monocular brass microscope in a walnut case. -Condition looks good, doesn't it? As far as I can see. I'm not an expert on these sort of things. £48. Actually, it doesn't look too bad at all. -I like it enough to make an offer. -what would be your offer on this? Oh, I love your work. I know you've got to make a living, but so have we. 15 is slightly out of my pocket. -We said that in jest, didn't we? -I'm willing to go to 25. -30 and you've got a deal. This Parsons-Laidlaw combo is now in full flow. Anything else take your fancy, chaps? John... John, what is that fascinating thing there? That is a match dispenser. -Every home should have one. Surely you should have got one of those already? You just lift that up, do you? small household items made of largely turned wood. -It's an uncommon object, is it not? What are we asking for that? Well, I defer to your maths here. Where are we starting with this? Because we love it, 15. -16... I hate odd numbers...in this instance. I see what you did there. Can't it be 16? -We've bought the two things. Absolutely great. I'm loving our work here. first shop, for the phone, the microscope and the match dispenser. And that marks the end of that round. -but what else can they pick up? -I mean, that's good. You know about cloisonne? -It has been dropped before. I mean, look at that. That is a metal vase, inlaid with enamel. I mean, the production time that has gone into creating that is ridiculous. It's Chinese, it's late 19th century, it's touristware, really. Why is it called cloisonne? Do you know why? The origin of cloisonne? -No, I have no idea either. -I thought you would, because you are French. Let me enlighten you, mes amis. separating each part of the enamel design. The French word for these partitions is cloison, hence cloisonne. The ticket price is £30. -It is a vase and what would we pay for this, £10? Let me do... Because you don't speak French. and what would we pay for it, would £10 buy it? -I don't know that we want to pay £15 for this bit of cloisonne. We'd love to buy something from you. I'd love to buy this from you for ten quid... What's your name again? Nicky? -I'm Gyles. Come on, give me the price. -I'll do it for £10. -Sorry, what has just happened? -I've bought this for £10. Gyles's unique bargaining style has worked so far. -That's £25 saved in their first shop. Tres bon. Paul and Nicholas are travelling 13 miles south to Rickmansworth. -Here to help is Dave. With time running out, does anything in Dave's empire take their fancy? Now, what do we have here? This is sitting on your counter. Now, we see lots of these. this cantle here bears Assay marks. -Assay marks. That's solid silver. Going to date to 1930, give or take, without looking it up. A rather pleasing example. What could that be? No price on that. -Dave, will you accept 50 for it? -I'm sorry, I can't, no. It's got to be 70. -As an item, it's worth well over £70. -Can I be advised by you? -Shall we go for 70? -Um... Do you know what? It's not a rash gamble. and if there's any justice in the world, you make a little. How about having another go at a deal, then, Nicholas? One last go, Dave. Will you accept anything less than 70? it's beautiful engraved wood there. and marquetry clock with enamel dial has a ticket price of £200. -I've looked at the back. The movement's excellent. And Dave's put it out at an excellent price. -And how much will he take off it? Can I make you an offer on that? And I know it's a hard offer. -£120 gives me some security. -I can't do it for that. I can't. I'll do it 135 for you. That's the bottom line on it - 135. -Do you like it? I know you like. -135? Yes, I like it. -We've bought the clock, haven't we? -And I'll come and bid at the auction. You'll be sitting next to me with your hands on your lap. Nicholas' tenacity has paid off at £65 off the original asking price. You could even say that that is the "Sale Of The Century". £200 gets him the clock and the purse. -Cracking bit of shopping from Parsons and Laidlaw there. Hertfordshire to the refined streets of Kensington in London. They've come to a place Gyles knows well to take a step back in time. Here to show them round is Daniel. -Hello, welcome to 18 Stafford Terrace. -David Harper, lovely to meet you. -Come in out of the sun. -Out of the sun and into the 19th century. -Is that where we're going? the art of cartoons through the new technology of photography. His house has remained practically untouched since his death in 1910. -Those biscuits have lasted well. Ha. This is why I love it. This is the home of high Victorian England. -and those he didn't know, he drew. He was a very distinguished cartoonist and illustrator. It's delicious beyond belief, isn't it? It's effectively full of treasures, isn't it? But Sambourne's roots were somewhat more modest. Give us Edward Linley Sambourne in a nutshell. Who was he? a Greenwich-based engineering firm, took up draughtsmanship with them. a friend of the editor of Punch. editor of Punch who thought that there was some merit in them. a highly regarded job in Victorian society. and a wealthy wife, he still struggled to live within his means. and mirrors so that you only see the expensive paper but it's visible. -They left the occasional gap. So it's an illusion, isn't it? really the resources to do it. most famously on Charles Kingsley's children's classic The Water-Babies. photography, as is evident all around the house. What did he do in here? and it was where he would come up to work every day. Sambourne realised he needed to work quicker. Photography and some unlikely models would enable him to do that. so he could take the photograph and then, effectively, trace it. studies and so on and can cut straight to the image itself. And so that really... I think he had a great theatrical streak. and dressing up as all kinds of things. He got his mother to be the Pope and Queen Victoria on the same day! So everyone had a turn. to make drawing them easier. Some, like Oscar Wilde, were only too happy to oblige. as well as these drawings? This gives us a very good illustration of Sambourne's process. develop the photographs, have lunch and then start work on the cartoons. And this is his work easel? This is his easel as it was up here in the studio. That little easel producing all that artwork. led Sambourne to find a whole new outlet for his creativity. people is still used today in Hollywood's animated blockbusters. Daniel, it's been an absolute delight. Thank you very much. -Thank you very much for coming here. We'll come back next week. We'll come and see you. So that's day one done and dusted. It's time for a well-earned rest before shopping up a storm tomorrow. and it's a gorgeous morning in the streets of old London. -David, what was it like yesterday, shopping with Gyles? Well, talk about energy. That man's energy level is off the radar. I mean, it's amazing. "I want to buy something with colour." Oh, OK.
"Right, there's something with colour." He'll go and get it. A decision-maker, my gosh. He doesn't muck about. I've had a brilliant time. What about you? -Well, I'd say more sedate, more leisurely. -Comes out of shell when it comes to negotiating. "What can this be?" "£65." "No, no, no, no, no, no, no. "How about how about I'll give you 25?" It's wonderful. Ah, sounds like it's all going swimmingly. the phone, the microscope, the match dispenser, the purse and the clock. -That means they only have £124 for the day ahead. leaving them with a well-stuffed wallet of £370 to spend today. How are our celebrities feeling on day two? You know, I want to do well at this cos I'm quite competitive. but you're one of the most competitive people I know. But you do it with such charm that we all accept it. but I haven't got that final oomph that you've got. Ooh, I don't know about that, Nicholas. Anyway, look sharp. -Talk about having an easy life. -Voices? I think I recognise them. -Well, I never. This is dreadful. -Good morning. Good to see you. -Good morning, Paul. Nice to see you. -Don't let the pressure get to you. -We need to be pumped up, Gyles. We are pumped up. I am pumped up and ready. -Do you mind if we just get going? -You two, carry on regardless. We've got some shopping to do. We've got a lot of catching up to do. So, with those two off, Paul and Nicholas can relax. -I think we bargained quite well, didn't we? I am in awe. I doff my cap to your bargaining approach. David and Gyles are starting their day in the London suburb of Clapham. -I have to tell you, I've seen Nicholas Parsons. He is over the moon with joy. He's bubbling with excitement. -He has spent, spent, spent. and here we are trailing. We have spent 30 quid. We've got £370 to go. We are going to go big. We're going to go bold. -In there? "Houses cleared". This is the place. Whoever she is, she's bought the stuff for nothing. "She" is Helen, late of Troy and now of Eccles Road Antiques. -Can I bring my young friend? -It's lovely to see you. Oh, this is enchanting. I'm just drawn to this. -I would say these could be 1950s. -I think they're earlier probably. -They could be '20s or '30s. -Meant to happen, meant to happen. Every breakage you have to pay for, apparently. -And that'll be £500, Helen, I assume? No, but actually it fell apart. It's already broken in the shop. Flat pack. It's what they did. -in the '20s and '30s and '40s. Where did they come from, Helen? What's the story? What's the provenance? -because I collected them over years, when my children were small. and they've been drying out here, hence no prices on them. There's no ticket, so how much does Helen want for them? I would hope to get £20 for the ones you've sorted. Bless her heart. Well, I was thinking a fiver. He'd probably give you a tenner. Could you do it for a tenner, the whole lot? Go on, go for it. -I bought them years ago. -Have we done the deal? -Who do I shake hands with? -You shake hands with me. I've done the deal now. Who have I bought them...? I'm completely confused. The Brandreth bluster has closed another deal. £10 for the toys. You don't happen to have a beautiful tin box? cos clearly I've paid a bit over the top. put these in it so it becomes a kind of magic box. -We'll go and look at some other things. -I will hunt in my basement. What can Helen rustle up? What have you got, Helen? -How about this for putting them in? -The very generous Helen has come up trumps. can I say, that's charming. A complimentary wicker hamper for the boys. -and I think you are going to be interested. ladies' silver pocket watch, circa 1900, 1910. -An Edwardian ladies' pocket watch. But it seems to have a little wristband? -It does, and that's the interesting feature. -of the wristwatch becomes popular. The ticket price on the timepiece is £58. What would be the best price you can give us? -It'll be cheap, Gyles, I wouldn't worry. It'll be so phenomenally cheap, it'll be ridiculous. Helen? -I mean, I think 20 would be very good, personally. -That's how I would feel. How do you feel, Helen? -Can we split the difference? -Oh, she was going there. -I'm on my way. Yeah, £20, go on. Whose hand do I shake? Oh, I shake yours as well. Marvellous. £20. That's marvellous. We will let you know how we get on. Tick-tock. I think these two both took a bit of a shine to Helen. they got the watch for 20. Still not spending big. And here to show him around is Tom. not medieval crypts, so tell me why we're here. which is the foundation of St John Ambulance. is a symbol that goes right back to 11th-century Jerusalem. a hazardous and dangerous journey. to care for the sick and needy pilgrims. and this was the idea of treating their patients as if they were Christ himself. and they'd be fed from silver plate. And silver has naturally antiseptic qualities. their rate of success in the hospitals was quite exemplary. However, this was all set to change. The Catholic Church ordered a religious crusade across the region. and became a formidable fighting order. Is that fair? Is that how it evolves or not? but if you're going back 800 years, it wasn't. -it was for your faith. You were fighting for the faith. and in 1309 the Order of St John settled in Rhodes. details the rules by which they lived. It has these wonderful woodcuts in it, which give stories. So, here you can see, here are members of the Order. -There is their eight-pointed cross. that the knights were duty-bound to live by. -And this was printed in 1496.
on the original clasp you've got the eight-pointed cross. I'll not look at the cross again and take it so lightly. became increasingly fragmented through time. closer to its original Hospitallier role. as an organisation to provide a standardised training in first aid. as a uniformed body to provide first aid at public events. and then for Queen Victoria's Jubilee. providing the same thing, meeting the medical need of that community. -Good, I'm glad. I've done my job then. -Let's go for it. Come on! -And let's buy some antiques! -Our last chance saloon, Gyles. -Mark. Lovely to meet you, Mark. Lovely to meet you, Mark. We hope to make our mark with you this afternoon. Well, you've come to the right place. We have two floors. and give me a shout if you need any help. -Our rule is to start at the top. -We're going upstairs. Follow me. Follow me. -OK, stick to the rules. and also heading for Northcote Antiques. I'm still going to be looking like my life depended on it. Helping them out today is Anne. -You've got some lovely things here. -Is there anything in particular you're looking at? -No, we're just looking for a bargain. -Excellent. We've got lots of those, I'm sure. -And you don't mind if we beat you down a bit? That's it, Anne, don't let his charm fool you. We're in this to not end up with auction egg on our faces. -But if we have fun, what does it matter? -Gyles wants to win, so let him win. -Well, that's fair enough with me. Speaking of Gyles, at the top of the shop, things have come to a stop. OK, a good stopper... You put the stopper in and it will fall out. -Does this come out of our £400? unprepared, we've never been here before. -We certainly shan't be coming here again. -We are now currently banned. Because you have a terrible effect on others. -So I will share the blame for that. -OK, that's very sweet of you. You did it. I don't know... Why did you do it? That's very generous of you, Gyles. We will of course reimburse the shop. Let's hope they're being a bit more careful downstairs. but I've never been one where I've seen so much glassware. You've seen all this glass. I can tell you, there'll be as much silver in here. that will sit with our silver purse a joy, a dream. what are Team Brandreth up to upstairs? Having a smashing time? -What on earth is it, apart from the obvious? -But for what reason? It's a tiny loom. What kind of carpet are they going to be making? Is this a sampler? Well, that will look lovely when it's finished, you know. Finish this, and you might find it is a magic carpet. What do magic carpets do? if David starts breaking anything else. Shall we find Mark and see what we can do? in case we see something really huge. Just don't touch anything which has a stopper. -Just keep your hands to yourself. are on the hunt for an item to go with their silver purse. I've seen a little snuff box here. Have you seen something? Show me your little box. This little snuff thing there. -A little vesta case, a little matchbox. The antidote to our treen example. that I think works even better with the purse. I like the expert. I follow you. Have a look. Let's have a look. The Art Nouveau one. -"Oh, my goodness me," is a good reaction. I prefer the other one. I'll wager you're a gentleman that will appreciate this object. -his accessory for the evening? -I've got one of those. Mine's black, but this one is gorgeous. -It's seen some life as well. -Look at the top of it. to mate up with the bag. and the malacca cane, which is ticketed at 65. Lots to think about. And Team Brandreth? Can we show you what we're looking at? It's in a little corner. -I didn't even touch it, Gyles. I know. You just need to WALK by and the whole place begins to collapse. LAUGHING: These two are like an old married couple. Are you buying the whole shop, Gyles? -It's not me, it's this man. -Keep on moving. Keep on moving. Paul, would you like to join me? I'm trying to get rid of this. Every part of the shop we go to, there are breakages. Gyles, it's like the playground. Last person to have touched David owns him. He's yours, I'm afraid. Nicholas and Paul were interested in, so stand by. that one would be £50. and this small vesta case here would be £40. -We're going to have movement anyway. I like the way you think, Nicholas. and then I'll do a little bit of bargaining with Anne. the Art Nouveau vesta case in sterling silver. -And what was the price you offered on that, Anne? If it was mine, I would probably say yes, but it's not. see if there's any way on Earth that it could be £35? And if it can be £35, will we buy it? -What do you think? It's only another fiver. Yeah, I think that would probably be possible. Have you made an executive decision or do you want to make a call? -I have. No, I've made an executive decision on that. I love you to bits, Anne. securing the Art Nouveau vesta for £35. But what about Gyles and David? -This is a very interesting, curious piece. -Yeah, tell us everything you know. -Well, it was bought in France. but how it was made. Can we go to the auction with four items? -I mean, sorry, 70 is ridiculous. Just for a moment... It's a nice, interesting item. We've got to make money at auction. What's your best price? What's your death on this? -Mark, is there no way you could make a corporate decision...? 50 or 60 on the spit of a coin, Mark, it would be done. and my job is far more important. You see, this is a proper negotiator. Congratulations. Well done, Mark, for standing your ground. or is it a little magic carpet? Well, this is the big excitement. Nicholas is looking incredibly confident. He's got this superb man in Paul Laidlaw. I wanted him, obviously. I've been lumbered with you. apart from your inability to negotiate. -And breakages. You have been fine. Paul has been invaluable to me. He knows it from an auction point of view. I think I have an eye for something which is attractive and interesting. -You clearly do. I've met your wife. Well, this is the moment. I think you should go first. -That's right, it is a lot of wood. -Yeah, there's a lot of wood there. I recognise one of these items. I've been to Nicholas' home. He brought this from his house. -Georgian revival, Edwardian, I assume? -This caught my eye as I went in and I couldn't resist it. -You're a bit of a clock enthusiast, aren't you? -I'm a clock enthusiast, yes. Actually, it's a beautiful piece. Again, lovely wood. -Rosewood, engraved and so forth. 135 it was. I got him down from 200. OK. This is the big spenders' table. Welcome to our world, OK? Ready? -Quite eclectic, I think you might agree. Gyles, we went traditional here, didn't we? -We don't want to yell about that. -the most unusual, quirky thing, is the loom. where it really originated from. We assume North Africa. I'm saying it's a magic carpet. -And I think we could get quite a lot of money for this. We've got more conventional things here. Yours are quirky and interesting. It will be a fascinating auction. Unusual and quirky. We were inspired by you. I thought about you at all points. -Unusual, quirky, don't know the value of it. -This is my friend talking! -a very interesting collection of real antiques, actually. -So, we'll see you at the auction. Now they're out of each other's earshot, what did they really think? Nicholas, they've spent no money. Do you like what they've spent it on? I think they've been very inventive and very creative. I like their items. Traditional, conventional. They paid far too much money. they have every opportunity of beating us. -I think we may be slightly ahead on value for money. -the conventionality of what they've got may paid dividends. before heading back out to auction at Bushey. I want us to behave at the auction today. I've seen the programme. What do you mean, you want us to behave? and try to encourage the crowd. -And I think that puts the crowd off. where the people from Bushey Auctions hold their monthly auction. David Porter is the man wielding the gavel today. What does he think about our teams' purchases? My favourite lot is probably the lunacy of the match holder. it's turned, and it's a novelty match holder. It's just a very strange, fun thing. This one has a slight dent in it. I have more worries about that than any of the other lots. Here's a rundown of what they bought. Nicholas and Paul parted with £311 for five lots. David and Gyles also picked up five lots, for only £120. The bidders are ready and our phone and internet bidders are poised. Let's get this auction started! It's first on the floor today for David and Gyles. I've got 20 there. 5 there. 30 I've got. £30, 35. £35 against you. Any more? 40 if you want it. I know we're not supposed to do this but this is a most unusual item. It's a lovely piece. Who's going to pay £40? It is a magic carpet. Gyles, it's not part of the game to heckle the auctioneer. trying to influence the crowd. Who's going to pay 40 for that wonderful speech? -I would have paid 40. -If that hasn't sold it, nothing will. I'm looking for a £40. There's nobody there at 35. Will we go back? Shall we go down? 30. 35. I'm going to sell this. £35. -It's your bid. Selling to you. Sold! Despite Gyles' best efforts, the magic carpet just didn't fly. That's a tough start for him and David. Oh, it is shaming. We paid £60. He paid £60. Next is another of David and Gyles' lots - the Scottish watercolour. Shocking, I know. £10, anybody, for an original work of art? £30 so far. £30. He's going to buy it at £30. Last chance for the rest of you. And to you, on the internet. The bid's here. At £30 and selling to you, sir. Thank you, gentlemen. It's a nice piece. That's better. The first profit for David and Gyles. Now it's the 1920s phone, just like the one in Nicholas' home. I've got to start the bidding at £10. Come on, don't give up now. Are you sure? I have £40. It's your bid, sir, at £40. At £40 I'm going to sell. £40 the bid. GAVEL BANGS Straight in with a profit. It's another Parsons-Laidlaw item next - the Victorian microscope. And I'm going to start the bidding here are £10 for a microscope. £20 so far, ladies and gentlemen. I think so. One more? 35. I'm going to sell for £35. Last chance to you all. GAVEL BANGS It's a profit. Just. Will this give Nicholas and Paul a hat-trick of profits? I'm going to start at £10. -Oh, you're doing... It's good. It's a gem. A gem. £45. Shall we make 50? It's a nice figure, don't you think? You're bidding against yourself now? I'll accept it. I'm not fussy. £55. Selling to you at £55. GAVEL BANGS Three in a row, fellas. A great bit of business on the treen. -Literally game, set and match. -No, well done, well done. -You've won the whole thing. -You've won the whole kit and caboodle. -I know what's going on. You know nothing. The show's not over yet, you know. to stay in the game. Let's start the bidding at £10. Come on. £10 for a basket full of fun and joy. -I think you're going to get £10, Gyles. -Who's going to pay £10. I've got 15. You're not going the big 20? Anybody prepared to pay £20? I've got 15 here. -Have you offended that man? Surely the basket's worth that? I'm selling it. Bargain time. £15 then. -I've got you. 20 there. 5, go on. 25. And...? 25. Still yours, sir. Bid's at £25. unless you want it on the internet. I'm selling then. That modest profit should help them catch up a tad. -That could have been worse for us. Next up, it's David and Gyles' vase. David, the auctioneer, thought this might struggle. Shocked me. £10. The bid's here at 10. £10. It's a maiden bid of 10. Now don't go mad. 15 is the next bid. 15. Come on. Have pity on an auctioneer. -That's 200% profit so far. -Oh, look, Gyles, you're doing well. -The internet are joining in the fun. £30 is the bid. Would you like...? Thank you, madam. 35 now. It goes to you, on the net. Bid's in the room at £35. If it weren't for the loom, we'd be way ahead by now. -He's still on about the loom. -£35. I will sell at 35. GAVEL BANGS That did rather well after all. Another profit for David and Gyles and it's nearly neck and neck. because David bought something paying rather over the odds. -we made 50% profit and 100% profit, and then 200% profit. So, I think we're doing quite well, the amateurs. The gifted amateurs are doing quite well. Experts... Not such a good day. Thanks for the update, Gyles. Moving on, it's the rose wood clock that Nicholas liked so much. I've got £65. Would anybody like to get...? At £100. There's a bid right at the back of the room with £100. Am I going to sell for 100? It is your bid. 110, I've got a new bidder. 120 now. I think it's worthwhile keeping going, don't you? Yes, sir? 130 if you want. No? At £120, you're holding the bid, sir. -No, keep it going, keep it going. -£120. I'm going to sell. Last chance on the internet. At £120 to you. That's the first loss of the day for Paul and Nicholas. You seem to have dropped £15 there. Now it's time for David and Gyles' timepiece - the ladies' silver watch. I see a forest of hands at £10. I've got 10 on the internet, funnily enough. -25? I've got 25. New bidder. I've got 40 suddenly from nowhere. On the internet at £40. -This is where you're lucky. -£45. I'm going to sell at 45. Another nice little earner for David and Gyles. Nicholas and Paul have one last chance to catch up. the Art Nouveau vesta case and the 1930s ladies' mesh purse. £10 the bid so far. Solid silver for £10. Two pieces in the lot. 10 is bid at the back. 15 now. 35 now if you'd like, madam. £35 is here in the fourth row back. 55. I've got a new bidder. -It's nothing on you yet. Gyles, stand up and give it a description and devalue it, please. For old time's sake? No? Are you sure? 75. One more? Take pity on me. It's hard up here. £80. At £80. It is your bid at £80 and selling at £80. but has it sunk any chance of winning? -We may just be ahead. -It was very, very close. Both teams started with £400. David and Gyles played a canny game. They spent small and made a small profit after auction costs of £19.40. and a big victory over the rivals. Gyles, what a team! In the end, what a team. -Just think where we'd be. We would be actually on the M1 towards the champagne supper. -With about one million quid. -With a lot of money. But as it is, a nice fish finger sandwich for you. -Will you drive me home now? As long as you promise not to talk about the loom on the way. -these two old chums now have to go home. -I'd forgotten about the loom! What's your abiding memory of our trip? -I think we've had a wonderful few days. It's been good, hasn't it? And the sun is shining. See you next time. Tatty-bye. TV and radio presenter Nicholas Parsons takes on writer and broadcaster Gyles Brandreth. With the help of experts Paul Laidlaw and David Harper, they scour Surrey for antiques before heading to an auction in Watford, Hertfordshire.